Custom Fitness Rehabilitation is a freestanding Physical Therapy facility in Guam. Our physical therapist, Dr. Ryan R.M. Claros, specializes in sports injuries, total orthopedic care, sports performance and enhancement programs. He is also currently an Assistant Professor at the University of Guam School of Nursing and Health Sciences and serves as the physical therapist for the Guam National Olympic Committee. At Custom Fitness Rehabilitation, we aim to improve the function and quality of life for our patients. We do so by identifying and treating the origin of pain (not just the symptoms) for each client and provide each patient with individualized therapeutic exercise programs. We place a strong emphasis on patient education throughout the physical therapy sessions to prevent new or recurrent injuries. It is our understanding that physical therapy is only successful as long as the patient puts in the necessary work; so in addition to scheduled sessions, patients can expect to receive Home Exercise Programs that they must do between appointments. Help us help you & call us to schedule an appointment. 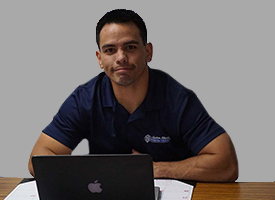 Dr. Claros helped me to properly recover from my back injury. In no time, I was back to being active and felt better than when I started. CFGM provides a well-rounded facility which caters to all levels of fitness. Having a resident physical therapist as a coach and owner doesn’t hurt either.